Flir - one of the most famous thermal imaging manufacturers introduced the "i" series that consists of three models - Flir ﻿﻿i3, Flir i5 and Flir i7. These are affordable models that are light and super easy to operate. They are aimed at consumers looking to step up from a regular IR thermometers and get into thermal imagers without breaking the bank. Flir i7 is the high end one in this line, while the Flir i3 is the entry model. FLIR i-Series infrared cameras are suited for leak and moisture detection, spot mechanical wear, electrical damage inspections and HVAC inspections. ALL three cameras have a 2.8" color LCD and a nicely build body that can withstand a 2 meter drop. They might look alike, but let's take a look at their specifications. 8.8" x 3.1" x 3.3"
Image Resolution - How do these infrared cameras perform? Thermal image resolution is probably one of the more important specifications you need to look for buying a thermal imager. These three cameras look alike, but the images they produce are very different in quality. A 60 x 60 sensor in FLIR i3 gives you 3600 pixels. A 100 x 100 in FLIR i5 gives you 10,000 pixels. As you can see on sample images, the higher resolution of the FLIR i7 gives a lot more detail and your can capture a larger area for testing. 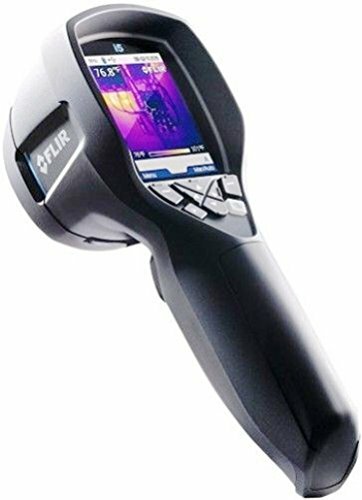 FLIR i7 price usually runs below $2,000 and in our opinion is a good choice as a semi-professional thermal camera. If you want more professional features, look into the E series like the FLIR E50 or FLIR E8. If we look at the specs, the obvious winner is the FLIR i7. Yes, it is the most expensive one of the three, but you do get much better image quality compared to FLIR i5 and FLIR i3.